﻿ Side table construction plan, free drawings. Tables from repurposed wood. 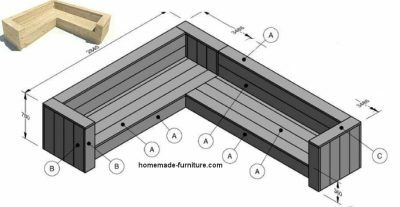 Side table construction plan for scaffolding boards. 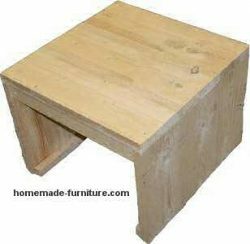 Free woodworking plans to make simple side tables from repurposed scaffolding planks and recycled wood. Basic construction drawing, farmhouse side table. Side table construction plan, free drawings. Tables from repurposed wood. 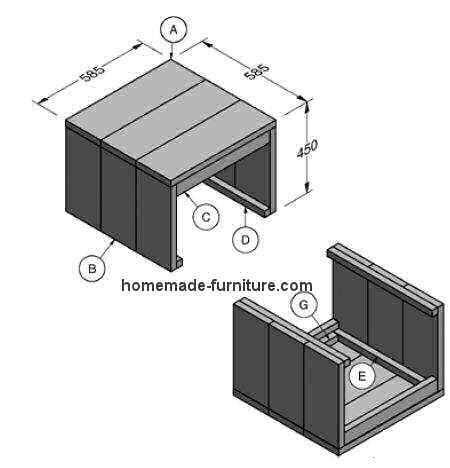 Free furniture plans » Lounge table woodworking plans. 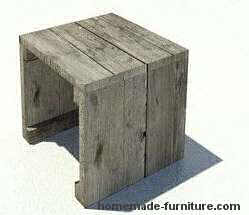 » Small size side table made with repurposed planks from scaffolding. Woodworking plans and construction drawings for a homemade side table. 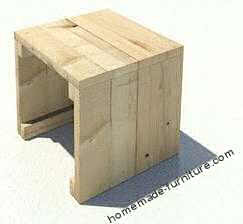 Reclaimed wood from scaffolding is very good suitable to make this lounge style side table. 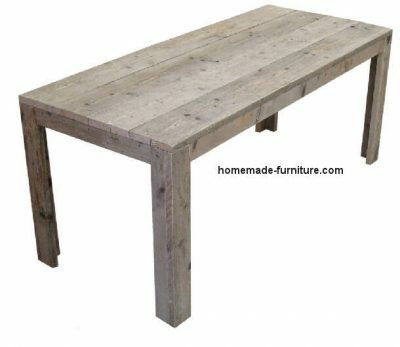 Farmhouse tables like the scaffold wood dining table as well as the lounge sets are very popular for DIY assembly. 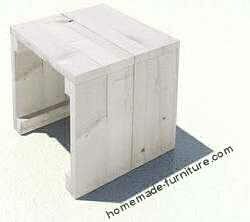 Sidetables and wooden planters are nice complements for this homemade furniture. These low lounge tables are great to finish off some leftover bits of wood. You can make them with just a few planks and slats. Construction time for this farmhouse furniture is minimal. Construction drawing to make a low lounge style sidetable. See the final sizes of this sidetable on these drawings for the construction. Ofcourse it is possible to change certain aspects and sizing for this side table. 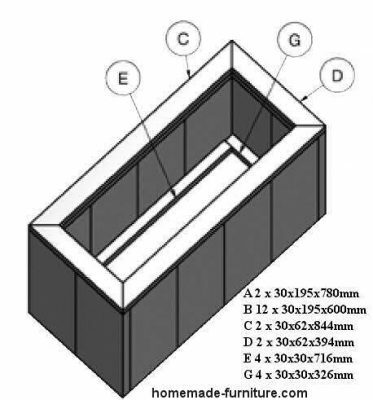 The exact measurements are listed below this construction plan. Explanation of all side table parts on the construction drawing. A 3 Planks, scaffold boards size 30×195 and 585mm. long. B 6x Scaffolding planks measuring 30×195 and 420mm. long. C 2x Slats, any type of wood and with sizes approximately 30x62x521mm. D 2x Square slat with sizes 30×30 and a length of 585mm. E 2x Square slats of 30×30 and 519 mm. long. G 2x Square slats 30×30 and a length of 461 mm. The finished farmhouse side table in four different finishes. 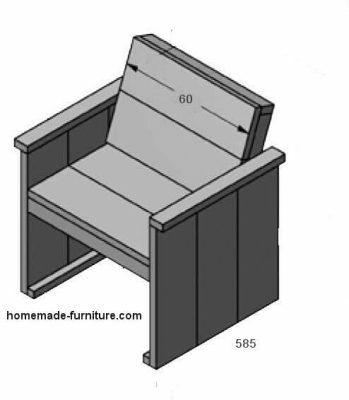 These woodworking plans are derived from our Dutch instructions for homemade furniture. 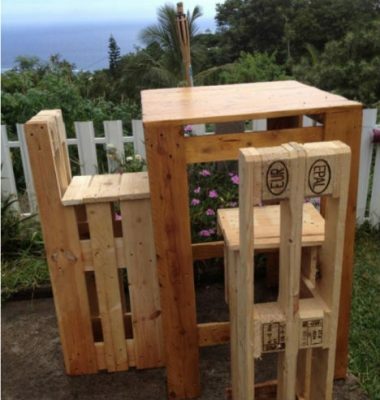 More examples for woodworking with reclaimed scaffolding. Matching tables and chairs in farmhouse style. 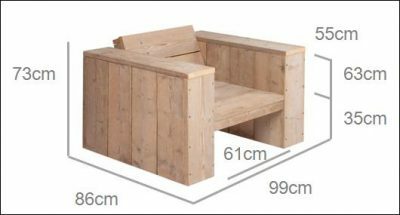 Lounge set consisting of benches with wide armrests and comfortable seats. 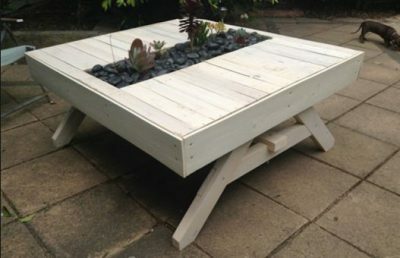 Make your own planter and cascading urban gardens from some leftover bits of wood. These garden chairs are made from four previously assembled panels. 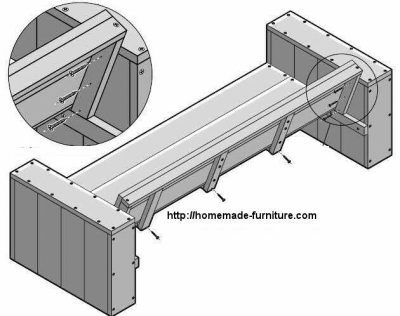 This corner bench consists of two parts for easier displacement. Fit the backrest between the armrests.